Off-Piste, ski touring, ski mountaineering, ski rando racing… If it involves skis, chances are we’ve probably done it! Every year we guide private groups and individuals throughout the Alps helping people realize their goals. This may involve a simple descent of the classic “Vallee Blanche” in Chamonix, a multi-day ski tour, or helping train individuals for demanding ski mountaineering races such as the Patrouille des Glacier. We specialize in customizing trips to suit peoples experience levels and desires. We have guided everything from classic Haute Route trips, ski/sail trips in Norway, ski descents of Mont Blanc and everything in between! Caroline grew up in the Alps and Adam has more than 8 years experience working here so we know the terrain, speak the languages and can help you realize your ambitions. 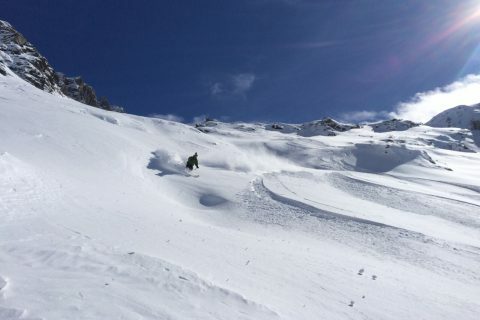 Whether that is a hut trip, freeride week in Chamonix, Swiss ski touring safari or a relaxing week cruising around resorts chasing fresh snow contact us to help you plan a trip of a lifetime!